Let's just get this off our chests right now: Tower Heist is not a great movie. This working stiffs plot to steal back what's theirs from a wealthy hotel head honcho is formulaic, witless and forgettable. And even with an all-star cast including Alan Alda, Michael Peña, Gabourey Sidibe, Mathew Broderick and Casey Affleck, Ben Stiller and Eddie Murphy, it's still a tired heist flick. Not to mention it totally steals major plot tricks from the far superior Oceans 11 movies (poor Casey Affleck). 1) Eddie Murphy takes one baby step closer to his Raw days. It's been five years since Eddie Murphy has been in a movie that adults--not just dogs and toddlers--can also appreciate. He sheds his pacifier-sucking humor to play a ghettofied blue-collar criminal-turned-thief, thankfully recycling some of his old school humor from his stand-up days. 2) It's lighthearted. Face it: we're about to be overwrought with oodles of heavy dramatic sagas this awards season. Some may make us want to jump off a cliff, more will make us want to kill our mothers, while others will force us to think too hard. Tower Heist is not one of those flicks. With this movie, you can shut your brain completely off, get a big bag of popcorn and get ready to chuckle a few times. 3) It's not The Zookeeper.. This is probably going to be a running joke for more months to come. Kevin James's lame comedy The Zookeeper still horrifies audiences and critics with its sublimely weak everything (plot, performances, etc.). So, many other mediocre comedies of its genre can only thank it for its weakness. The Zookeeper makes every other movie looks like Oscar bait. 4) Gabourey Sidibe is beyond Precious. Two years after her breakthrough performance in Precious, folks still associate the Oscar nominee as the downtrodden overweight single mother living on food stamps in Harlem. Even after roles in Yelling to the Sky and Showtime's The Big C, it's been hard for Sidibe to move away from her first film feature. But in Tower Heist, she portrays Odessa, a Caribbean housekeeper in one of the most luxurious buildings in Manhattan. She dons an unrecognizable accent (very well, mind you) and whip-smart humor. So long Precious. 5) Although the cast of Tower Heist wasn't Murphy's first choice, they still have good chemistry. 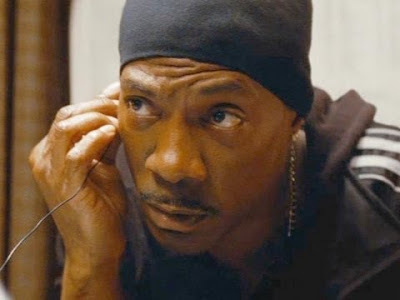 You may have heard through the grapevine that Murphy originally wanted to assemble an all-black cast with himself, Chris Rock, Dave Chappelle, Tracy Morgan and Martin Lawrence. But for some reason the Hollywood big wigs didn't hastily jump on that idea. But, perhaps with a better script (or a whole other movie) the finished cast could have really shined. They worked well together, they're all legitimately funny, and they fit right onto the bromantic comedy bandwagon Hollywood seems to be going gonzo over these days. You'll get the next one, fellas. Yes! Gabourey beyond Precious. I think this will be the first time most have seen her outside of Precious (The non-Showtime, non-indie crew :-) I'm going to try and see Tower Heist. I must say I was disappointed when I saw this trailer. I feel as though Eddie Murphy can do a whole lot better, but there is going to be a core audience for this so it should be interesting to see how it does. Gabby Sidibe's first steps in the press tour probably revealed that she's meant to become a comedic actress. There's an intelligence within her even when she seems to be playing the most basic of characters. Made me laugh and held my interest more than it should have, given how sloppy it is. Call it an acceptable bit of B-minus work from a C student. Good review Candice. I love Gabby! She makes me want to watch this, even though I know it won't be great.